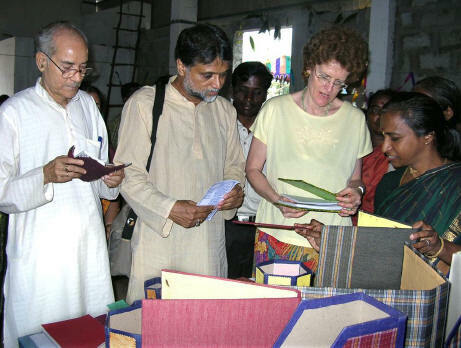 Following the tsunami on December 26, 2004, the Theosophical Order of Service has been involved in extensive relief and rehabilitation efforts along the coast of Tamilnadu. After the initial phase of emergency relief, the Chennai TOS has concentrated its efforts in two major areas: providing potable water and facilitating alternative employment for fisherfolk. Four reverse osmosis plants with a capacity to purify water at a rate of between 1000 & 1500 litres per hour have been set up in Chandrapadi, Nambiyar Nagar, Kutiandiyur & Nagoor. One more is planned for North Madras. In addition, the TOS has facilitated the donation of a sixth reverse osmosis plant from Canadian Water Works with a capacity of about 1500 litres per hour, which is installed at Akkaraipettai in Nagapattinam. For greater effectiveness, the TOS has partnered with NGOs, companies and individuals. The pumps for the first five plants were donated by the Danish company, Grundfos, through its Indian subsidiary. A seventh reverse osmosis plant, with a capacity of 600 litres per hour, was given in September 2005 by the German manufacturer K‘a’rcher, through Manmachine India Ptv Ltd. All these plants are managed by the Thirumalai Charity Trust with a subsidy from the Theosophical Order of Service. As part of the alternative employment programme, 91 sewing machines have been donated for centres currently training women in tailoring (above). Thirumalai Charity Trust has partnered in this project with a donation of 41 machines. Most of the local groups running these centres are supported by the ‘Unorganised Workers’ Federation’ which is dedicated, amongst other things, to helping women toward economic independence. Women the world over will be interested to learn that ‘women’s empowerment’ is a theme much in evidence in these districts with project signs explicitly mentioning it. One unit is run by a separate group, near Chennai. In order to provide additional support, a further 33 high-speed industrial sewing machines are being donated for commercial use by the trained women.